Compass returned to the market in September 2013. It’s a brand that dates back to the 1970s, but parent company Elddis discontinued it in 2009. However, it reversed that decision for the 2014 season, arguing there was not enough choice for caravan buyers. Elddis promised that the new line-up would not comprise badge-engineered versions of existing models, and launched three ranges: the entry-level Corona, the mid-priced Omega and the luxury Rallye. 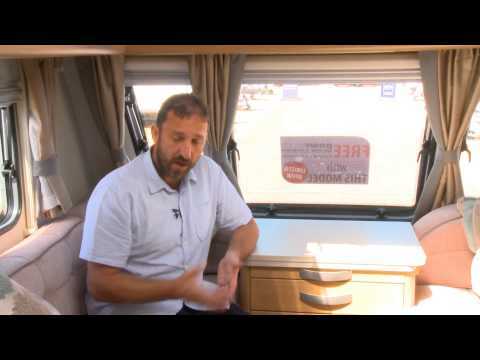 We’re looking at the Rallye 554, which features a full-width end washroom and a transverse island bed. It’s the ultimate luxury layout that was introduced to single-axle tourers only in recent years. The Compass Rallye 554 competes with the likes of the Swift Challenger SE 580 and the Bailey Unicorn Vigo. It shares a bodyshell and layout with its sister model from the Elddis Crusader range, and it’s also built using the SoLiD (strong, light, dry) structural bonding method in which the walls, roof and floor are glued together, making for a strong, waterproof shell. It gets a 10-year body-integrity warranty against leaking and it has showroom appeal, with its minimal blue-and-grey graphics and attractive sunroof. As you’d expect from a premium model, it is loaded to the gunwales with external equipment: it’s built on an Al-Ko chassis, which differentiates it from Elddis’s own-brand models, which are built on BPW chassis. The Rallye gets ATC trailer control and shock absorbers as standard, along with the Al-Ko Secure wheel lock and a Phantom tracking system. It boasts tough GRP sides, mudflaps and a 40-litre on-board water tank that works in tandem with an Aquaroll, plus external satellite TV, aerial, 230V and gas points. Step inside this Compass Rallye 554 and you’ll quickly see that, although the 554 is marketed as a four-berth, it is more likely to be used as a luxury tourer. Couples will not convert the lounge into a double bed unless they have occasional guests to stay with them. Of course, the washroom and the island bed put the squeeze on the lounge, where space is at a premium. An occasional table slides out from beneath the central dresser top. The free-standing table, which is stored in the wardrobe by the main door, will accommodate four diners, but in rather cosy confines. The must-have integrated sunroof, which is something buyers have come to expect in caravans at this price point, does a good job of illuminating the lounge during the day. The light-toned cabinet work is pleasantly complemented by a brushed-metal effect finish to the handles. The oatmeal upholstery and green detailing in the curtains and cushions are appealing, and those cushions offer plenty of support and chunky knee rolls. The attention to detail throughout is impressive: there are coat hooks by the door, and drawers are built with dovetailed sides and patterned bases. The over-locker lighting is appealing throughout, and the LED lights create a warm ambience. Heating and hot water are provided by Alde’s wet central heating system, which uses the latest, user-friendly touch-screen control panel. As in the lounge, the kitchen is squeezed a little, but overall it is well-equipped. There’s a slide-out worktop extension to provide chefs with a little more workspace, and two electric sockets will be ideal for a camping kettle and a toaster. The granite-effect plastic sink is deep, while the hob has three gas burners and an electric hotplate. Below are a separate grill and oven, and above it is a microwave oven, which is fitted as standard. Overhead, there’s an Omnivent fan, a premium piece of kit that can extract odours or blow in fresh air. The kitchen is neatly styled, with coordinated, brushed-steel facings for the sink, microwave, hob top, above the Thetford grill and oven, and to the Dometic fridge door. There are racks for cups and crockery in the overhead lockers, which get push buttons rather than handles, to help differentiate the kitchen from the rest of the living space. It’s a really wide galley, with loads of space for the caravan cook to manoeuvre and opposite is a dresser, topped by a worktop that’s lower than the kitchen’s. Beneath it is a drawer, which houses a moulded cutlery tray, while an adjustable bracket for a flat-screen TV is mounted above the dresser. Overhead is a drinks cabinet with an acrylic door and ambient lighting. The washroom is another star feature of the Rallye. Its sliding wooden door opens to reveal a large shower cubicle. Although it’s not the deepest rear washroom we’ve tested, there’s plenty of legroom around the toilet, which sits beneath an opaque window on the offside. Alongside the toilet, a towel rail is fitted above vents for the Alde heating, although there’s not the heated towel rail we’ve come to expect from vans with Alde heating. Elsewhere, there’s a chrome-effect toilet-roll holder and clothes hook, and a large basin beneath a vanity mirror. The fully lined shower cubicle has a bi-fold door, and a showerhead that is on a riser bar to let you adjust the height easily. The island bed has a padded headboard with two directional reading lights above it. The two small shelves are above at the corners, each with a retaining rail. They are ideal for specs or a mug of tea. It’s a lovely, comfortable bedroom and a really luxurious arrangement. The area can be partitioned off from the kitchen and lounge by a concertina-style blind. Unlike some versions of this layout, the Rallye’s transverse island bed is not shortened by day. It is genuinely a fixed bed that remains at its full length, sparing you the hassle of having to make it up at night. This does, however, reduce access around the foot of the bed. In the lounge, the seat benches can be converted into a generously proportioned double bed. The slats are secured in runners, which makes them easy to pull from the central chest and return in the morning. The space beneath the island bed is massive, but avoid loading it with all your biggest, heaviest gear before hitting the road. Elsewhere, there are wardrobes and drawers on either side of the island bed, and plenty of overhead lockers throughout for storing all your bits and pieces. At the end of the Practical Caravan Compass Rallye 554 review, it is clear that this caravan is a solidly built luxury tourer whose looks are up-to-date and whose kit list is filled with much of the latest gear. The island bed has eaten into the space left for the kitchen, lounge and washroom, but the 554 is still luxuriously appointed. Some may argue that it’s too much like an Elddis Crusader, but it will appeal to anyone who prefers simple styling over flamboyant touches.